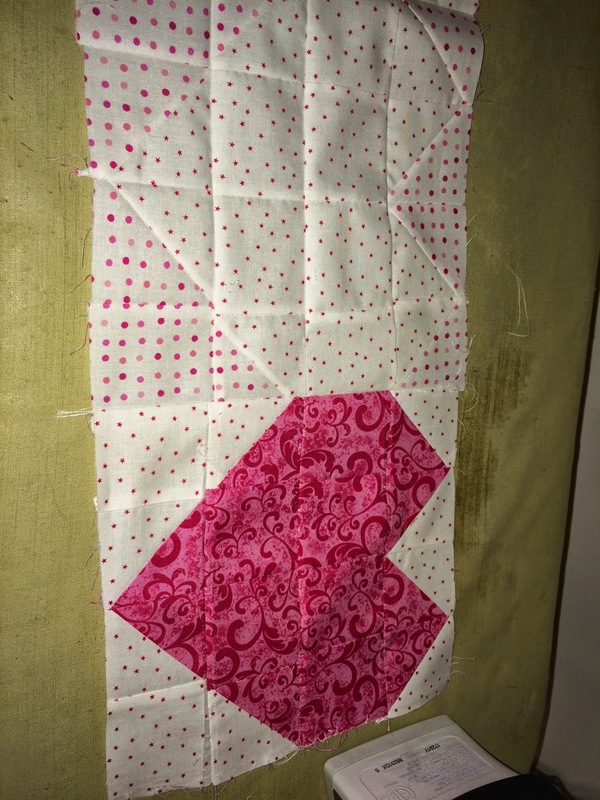 Dinie's Tangled Threads: Valentines day (2015) quilt and dress. 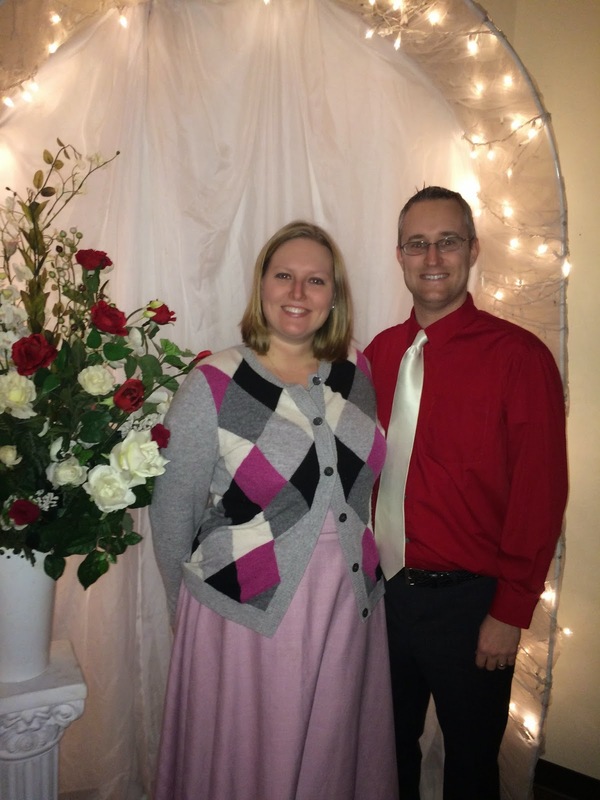 Valentines day (2015) quilt and dress. This is from Valentine's Day 2015. I am still not finished with it, but I am so close. Since we will not be in MN on Valentine's day I haven't had the motivation to finish it all the way. I'm hoping that you will see it on 'Me Made 2016' this year! These are the colors that I'm doing. I made up a pattern that comes out looking like a heart on a different background. I'm sure that someone had made it up before me as it is not terribly hard, but I don't know who and I'm not looking it up. Here are some in progress shots. I wasn't too concerned with this since I was trying to finish it up fairly quickly. But, this gives you some idea of how involved this project was/is and how stupid I can be sometimes. As of Feb 9th I have 4 more days to finish it up and give it to the church and I'm about half way done with the squares. 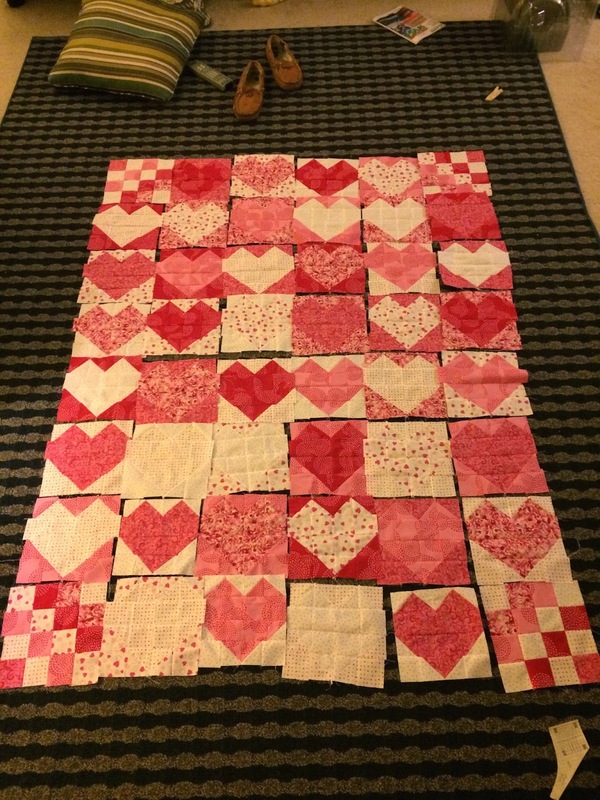 I am making 46 heart blocks and 4 corner blocks with some of the leftover blocks. All the squares laid out, before sewing them together. I know some of the whiter blocks look like they are running together here. But they look better in person. Here are a few of the heart blocks and my corner block. 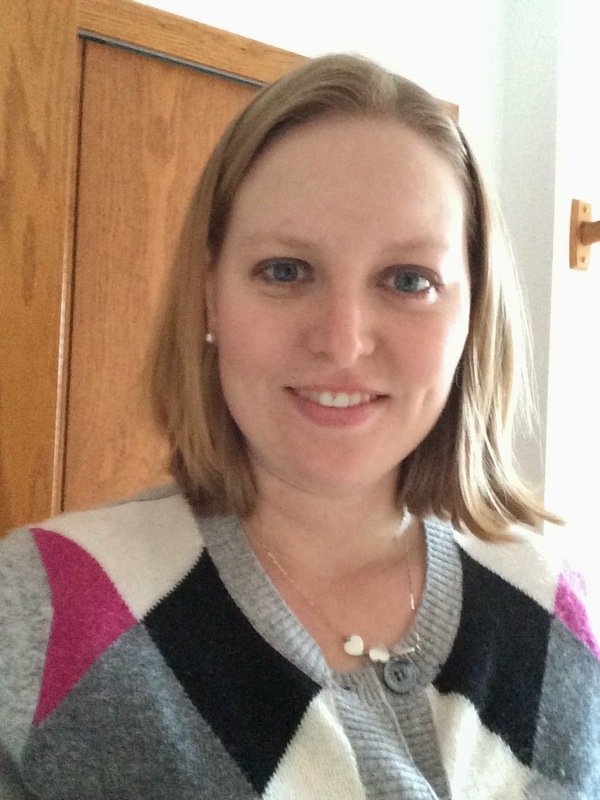 Getting ready to go out on Valentine's Day. It was cold! 9F. We had a great time. Even though I didn't get the quilt finished. Or the dress. I'll get to them. But, I'm trying not to stress out about little things like this anymore. I'm very excited to finish both of these projects. I've stayed up late into the night working on the quilt so far. And I'm sure that I will have the same issue with the dress. But, Valentine's day was a great night.